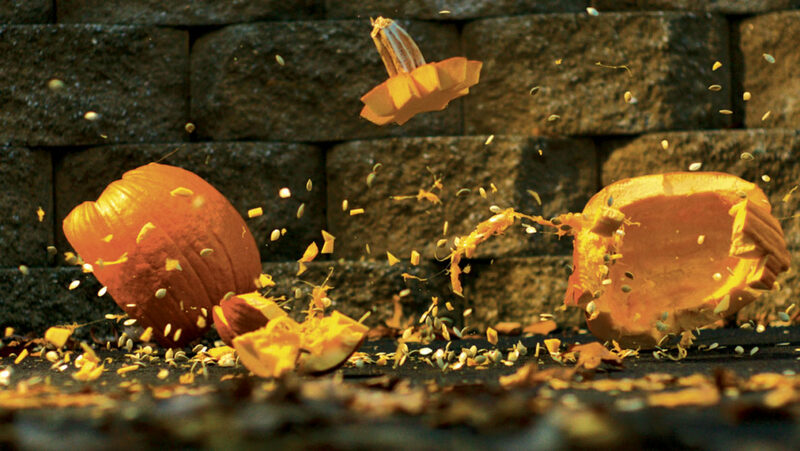 On the ground, Butch T. Cougar begins a countdown: five, four, three, two… At one, the hands release a 10-pound, half-frozen pumpkin that rockets to the courtyard, exploding in a confetti-bomb of cheers, screams, and a thousand gooey fragments. Strains of Galileo Galileo from Queen’s “Bohemian Rhapsody” fill the plaza and down comes another pumpkin, then another and another. 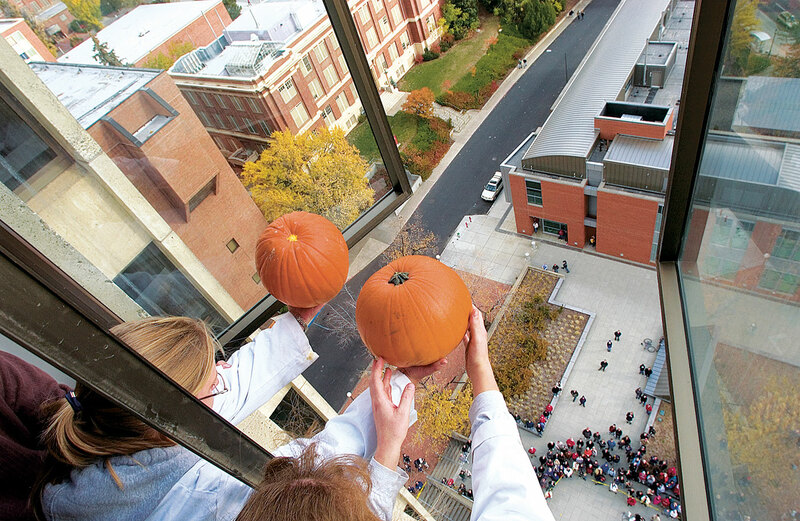 So begins that nerdy-fun Dad’s Weekend tradition—the Pumpkin Drop. The event has been a campus favorite since it was introduced in 2004 by the Physics and Astronomy Student Club, then led by physicist Fred Gittes. In 2005, senior instructor Nicholas Cerruti ’98 MS, ’00 PhD took over as faculty advisor. Guenther was closely involved in the event for more than a decade and says they got the idea from California Institute of Technology, which has sponsored a Halloween pumpkin drop every year since 1972. Besides the fun, Cerruti says the project is an engaging way to help teach science—and an example of the tactics he uses to inspire students who enroll in his introductory physics courses. The key, he says, is to focus on the fascinating, gee-whiz aspects rather than just dry mathematical formulas. Cerruti achieves this through practical lessons like throwing an audible football across the room to illustrate the Doppler effect, where sound appears to change as an object approaches and then recedes. “I try to do one demonstration each class period—from very simple things like dropping a ball, to something more memorable like shooting a monkey out of a tree,” he says. In the latter experiment, a stuffed monkey is held in a tree by an electromagnet. Cerruti shoots a dart gun, which releases the magnet allowing the monkey to fall. The dart hits the monkey in midair. Galileo Galilei discovered the principle when he reportedly climbed the Leaning Tower of Pisa some four hundred years ago and began dropping cannon balls, musket balls, gold, silver, and wood. To his surprise, they all hit the ground at the same time. This discovery led to the “Equivalence Principle,” which says that gravity accelerates all objects at the same rate, regardless of mass or composition. The rule became a cornerstone of modern physics including Einstein’s general theory of relativity. She says one of their most memorable drops took place in 2013, the infamous year of the glitter pumpkin. The cleaning crew, however, was less than thrilled as it took forever to mop up the billion sparkles splattered all over the courtyard. The club unanimously voted to never do that again.